With St. Patrick’s Day so popular a holiday, it’s appropriate to discuss the continual search that so many in our society go on for the leprechaun’s pot at the end of the rainbow. Whether it’s winning the ultra mega grande lottery, getting a massive inheritance from some long-lost great aunt we never knew, or being discovered on Simon Cowell’s latest production, it a great American pastime to seek an immediate fortune. This is not new, of course. The forty-niners of the mid-1800s sought their fortune in the California gold mines. Neither is it an out-dated phenomenon. Today’s North Dakota oil rush is calling fortune seekers from around the country to try their hand at high-paying, albeit sometimes dangerous jobs. What should be instructive about such spectacles is an understanding of who actually ends up wealthy as a result of these “rushes.” Very few forty-niners ended up wealthy for the long haul. Those who came out of the California Gold Rush with lasting fortunes mostly included those who sold goods and services to the miners. I fully expect any lasting North Dakota fortunes to come out of the same vein. Why? Because those who seek to make their fortunes overnight tend to be those who spend their fortunes overnight. The National Endowment for Financial Education estimates that up to 70% of people who receive a sudden windfall of cash will lose it all within just a few years. If you look at the list of American Billionaires, or if you research the most common major of American millionaires, you won’t find any lottery winners or poker aficionados among them. Yes, you will find Wal-Mart and Mars Candy heirs at #6-9 and at #15 on the Billionaire’s list. However, I’m pretty certain they all knew their fortune was coming. You will also find casino owners… just not casino patrons. So what is one to do if you’re aspiring after fame and fortune (or at least fortune)? First and foremost, get some perspective. Not all, but the majority of fortune seekers think that their lives will be better if they just had more money. The reality is that money, in and of itself, will never bring happiness, and, in large quantities dumped into unexpecting pockets, can actually bring increased misery and pain. Instead of being the end goal, money should be considered merely a tool. And like any tool, money can be used to build something of lasting satisfaction or it can bring us pain through its misuse. To make money a tool, you simply need to create a plan to achieve something that requires money. For many, this plan is retirement. For others, it’s starting a business. For others still, it’s living in a dream home. Whatever the end goal, make plans to get there. Specifically, create a savings plan so that you know how much to put away in the short and long term. Then create and live by a spending plan (a.k.a. Budget) so that you know what your spending limitations are. 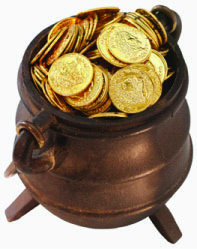 As you build your life’s fortunes (whether or not they include financial wealth), may the leprechauns of St. Patrick’s Day bring you good luck rather than fairy mischief! My Multi-generational Experience at Disney What's Wrong with the Campaign to Ban the Word "Bossy"?